Autoridades buscan a Antonio Medina, 28, quien se cree es un indigente y es sospechoso de la muerte a golpes de su novia Kassandra Ochoa, 21. El cuerpo de Ochoa fue encontrado alrededor de la 1am del sábado en la cuadra 400 de South Sydney Drive al lado del cementerio New Calvary y la autopista 710 Long Beach, informó el departamento del alguacil. “Medina … fue visto huyendo de la escena después de que se escuchó discutiendo con la víctima, dijeron testigos”, según la declaración del alguacil. Detectives creen que todavía podría estar en la zona y se circularon fotos de él, descrito como hispano, de unos 5 pies y 7 pulgadas de alto, y pesa alrededor de 180 libras. Quien tenga informes de su paradero puede llamar a la oficina de homicidios del alguacil al (323) 890-5500, o a Crime Stoppers al (800) 222-TIPS. Transient Wanted In Killing of Woman In East L.A. Authorities today named a man wanted as a suspect in the beating death of his 21-year-old girlfriend, whose body was found next to a cemetery and freeway in East Los Angeles. Deputies responding to an “assault with a deadly weapon” found Ochoa bleeding and unresponsive, she was pronounced dead at the scene. The cause of death was blunt force trauma to the head, according to the county coroner’s office. “Medina … was seen fleeing the scene after he was heard arguing with the victim, according to witness accounts,” according to a sheriff’s statement. 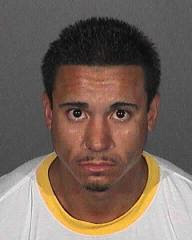 Medina is believed to be a transient, and is known to frequent the East Los Angeles area. Detectives believe he might still be in the area and circulated photos of Medina, described as Hispanic, about 5 feet 7 inches tall, and weighing about 180 pounds. According to witness accounts, he appeared to be wearing a grey thermal shirts and dark pants at the time of the incident. Anyone knowing his whereabouts was urged to call the Sheriff’s Homicide Bureau at (323) 890-5500, or Crime Stoppers at (800) 222-TIPS.